The idea for a Saab convertible, now an automotive icon around the world, first took hold in the United States. After convertibles had disappeared from the American marketplace in the early 1980s, Saab USA President Bob Sinclair realized there was a tremendous market niche to be refilled. While the popular hatchback Saab 900 was not suitable for conversion, a limited run of two-door 900 sedans with conventional trunks and steel roofs sparked Sinclair’s interest. 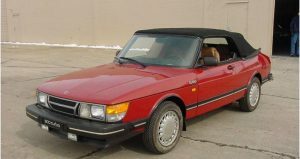 American Sunroof Corp. was commissioned to create a soft-top, four-seat Saab 900 Convertible based on the two-door sedan. A pearl white prototype was unveiled at the 1983 Frankfurt Auto Show as a design study. Overwhelming media response and consumer interest left Saab with no choice but to gear up for production. 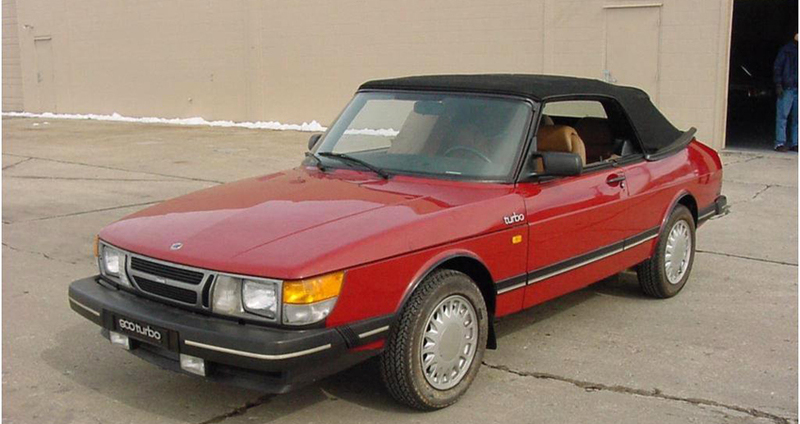 The Cherry Red 1986 Turbo Convertible in the Heritage Collection has been owned by Saab USA since it was new. It has a black top and some prototype parts of the rear spoiler rendered in wood. The 1987 model, featuring a more sloping front end, was sold out long before its production began, and 1989 models were already being ordered in the autumn of 1986. Overall, almost 49,000 first-generation Saab Convertibles were sold between 1987 and 1993 at an average of 7,000 units a year, or 14 percent of all Saab 900 production.